The lioness then digs her teeth into his right forearm, penetrating to the bone, and drags him towards the fence. The lioness keeps hold of his arm for a full five seconds, slashing at it with the claws of her left paw, before finally releasing him. 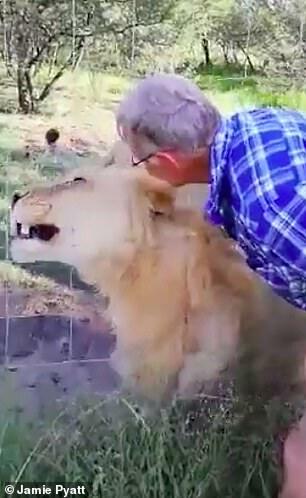 Panicked screams of those watching distracted the lioness for long enough for Pieter to pull his bloodied arm back on the other side of the wire. Netwerk24 reported that Mr Nortje ended up in Pelonomi Hospital in Bloemfontein in a serious condition and suffering septic shock. Septic shock is a life threatening condition caused by severe infection with a mortality rate of between 25 and 50 per cent. A spokesman for Tikwe River Lodge, which has 30 lodges overlooking the Sand River, said they had been running the lion enclosure tours for six years without any incidents. They denied any responsibility for the mauling and said: 'There are warning signs everywhere. 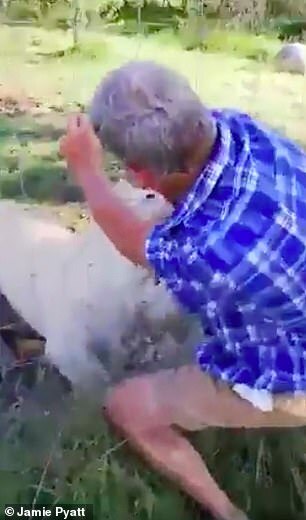 'Nortje stuck his hand through the electric fence to touch the lions and was bitten'. 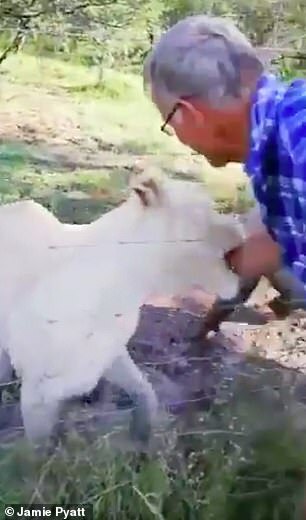 A South African game ranger at another park who saw the video said: 'The man was lucky that the lioness was probably not hungry or not used to killing live prey outside in the wild. 'Lions are pack animals and hunt as a team so others in the enclosure could easily have joined in and if they had done [they would have] killed him whether there was a fence between them or not. 'Some people never learn that where wild animals are concerned, keep a distance between them and you'. Mr Nortje, who works as a mechanic at SA Truck Bodies in Bloemfontein, and his receptionist wife were unavailable for comment as was a friend who joined them for the weekend break. 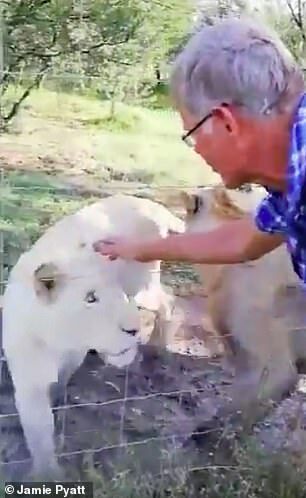 In May last year Mike Hodge, 72, the owner of the Marakele Predator Centre in Thabazimbi just north of Johannesburg, was attacked by a lion when he entered its enclosure. British-born Mr Hodge was badly mauled and was only saved when the lion, called Shamba, was shot dead by a keeper after it had dragged Mr Hodge into the undergrowth where it was savaging him. 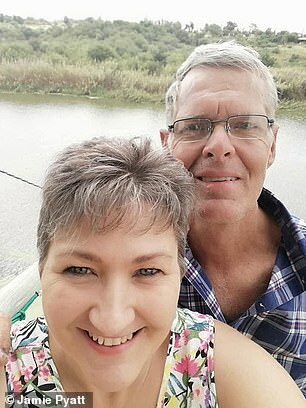 The married family man was rushed by air ambulance to hospital for life saving surgery on wounds to his neck, chest and back but is back running his game lodge now. In February last year a 22-year-old woman was attacked and mauled to death by a lion at the Dinokeng Game Reserve in Hammanskraal after getting out to take photos of wildlife.